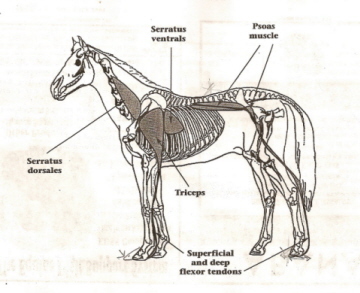 What Lies Beneath the Rider’s Seat: The Horse’s Psoas Muscles! When looking at the horse, it’s good to develop that type of curiosity as well. Understanding how the horse works can help enable us to better understand what the horse needs, in order to do the job we ask him to do or – and this is a whole topic on its own – how we unintentionally prevent him from doing what we are asking our horse to do. If you answer ‘yes’ to any of the above, you have had a direct request line to the psoas muscles. They pull the strings in all of the above. However, the tricky part is, you cannot see or feel them on the horse. There is no way to palpate them to see whether they are tense or hardened or reactive. Therefore, massaging them for example, is not an option. Where exactly are these elusive psoas muscles located? The psoas muscles are deep inside the horse's anatomy. What happens when these muscles are rigid, permanently contracted, restricted? So we see from this very small glimpse at the complicated world of the equine psoas muscles, that they are incredibly important to the functionality of the horse’s anatomy and his ability to perform the tasks we ask of him. What can we do to keep this muscle supple? The first and foremost aspect surely must be proper gymnastistizing. If this element is neglected, all other efforts will be rewarded by only temporary results. There are good books, DVDs and instruction available around the topic of gymnasticizing, from the classic “Gymnasium of the Horse” to books and videos by Klaus Ferndinand Hempfling, Mark Russell and others. I don’t want to present any gymnasticizing techniques in this article, but encourage you to explore the topic further. The second aspect is eliminating everything that can impede the free range of motion of the horse, such as improperly fitting tack (especially ill fitting saddles), improper angles of limbs resulting from improper angles in the coffin bone due to inappropriate hoof trimming (see this article) and the influence of unbalanced riding. Proper trimming and hoof care is also important, since a faulty angle can put a strain on the psoas muscles. What to do, if the psoas muscles are restricted? As Dr. Harmann explained above, massage is not an option, since one cannot reach these muscles deep inside the horse’s body. The only way to release tension there, is to have the horse actively release it. Jim Masterson, equine massage therapist for the US equestrian team (endurance), has developed a bodywork technique that engages the horse’s help and cooperation in releasing tension in deeper junctions of the horse’s anatomy, such as the psoas muscles. This method of bodywork is called the Masterson Method™ (Integrated Equine Performance Bodywork™). Here, the practitioner or horse owner learns to engage the horse in a series of exercises, that release tensions deep inside the horse’s body. Every time I teach a Masterson Method™ student how to release tension in the hind end, I see my son’s face when he used to figure out how things work. It’s one thing to read a book about it, it’s another to actually take the alarm clock apart! Feeling tension dissolve under your hands is an incredibly rewarding experience. 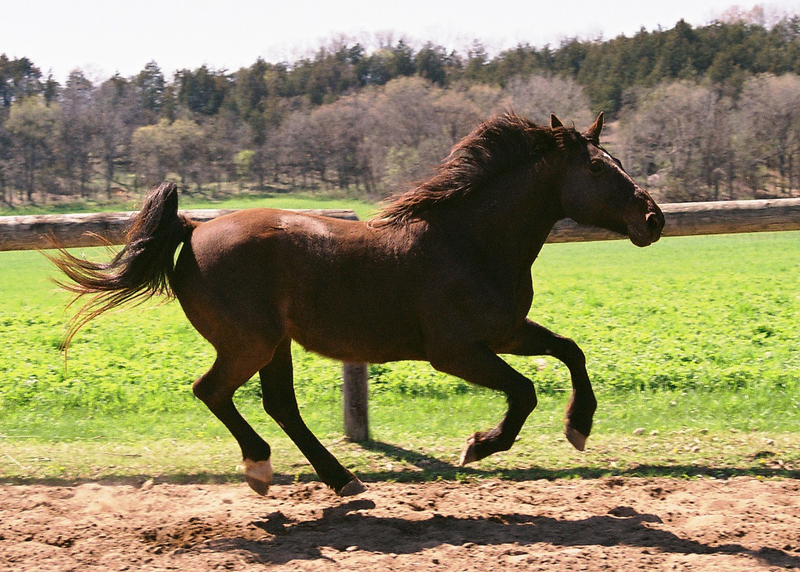 The equine body is a complicated machine, but the principals under which it operates and functions can be easily learned and so can techniques to restore suppleness and performance to horses that suffer from muscular restrictions. To learn more about Masterson Method™ or Hands-On Horse Mechanics™ seminars go here. ← Horizontal meets vertical: the rider’s role in keeping the horse sound. This is a good post. It’s very helpful to see the skeletal diagram illustrating exactly where the psoas muscles run and to hear your explanation of how, when these muscles tighten, it seriously impacts the horse’s movement.